This year’s London Wine Fair, being held at at Kensington Olympia, May 3-5, will play host to the largest and most diverse content to date, says show director Ross Carter. The exhibition company Brintex has announced that there will be more than 100 sessions during the three days of the fair, spanning: Industry Briefings; Masterclass tastings; the new Pop-Up Tastings; The View Tastings; and Speakers’ Corner as well as specific events taking place on exhibitor stands. This year, for the first time, visitors will be able to sign up to these sessions via the new Bottlebooks booking system, which also allows attendees to search and download details of specific wines and wineries exhibiting. The full content will be available from mid-April. 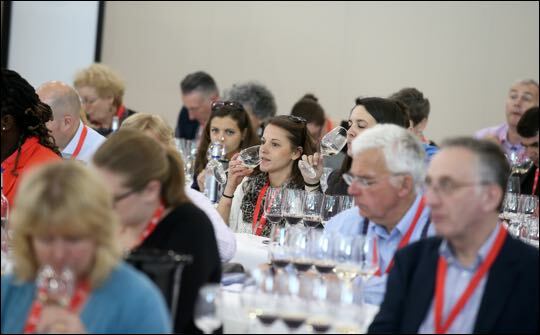 The Industry Briefings, which will be hosted in The London Room, include the inaugural London Wine Fair Grapevine Debate, chaired by drinks journalist Richard Siddle. Tony Edwards, author of “The good news about booze” and University College London Pharmacologist, Professor David Colquhoun, will debate “Is drinking good for your health?" Chief executive of The Wine & Spirit Trade Association, Miles Beale, will update the industry on the growth of English Wine; its future and potential impact on the UK wine market. And, there will be a taster preview of the International Cool Climate Wine Symposium 2016, which takes place in Brighton, May 26-28. The Masterclass Theatre (A50, West Hall) will showcase regional and producer-led tastings. These include: Vineyards of Hampshire, with Sunday Telegraph wine writer, Susy Atkins, presenting a selection of wines illustrating the distinctive style of the county; and Tejo: Warm Days – Cold Nights – Cool Wines! presented by wine writer, Dr Jamie Goode and winemaker Martta Reis Simões from Quinta da Alorna, who will explore the diversity of wines from this upcoming Portuguese region. Over in the new Pop-Up Tastings, renowned Australian winemaker, Larry Cherubino, will present a tutored tasting: Great Southern at a glance, which will include the wines from the Great Southern Wine Region, with its five sub-regions of Denmark, Frankland River, Mount Barker, Porongurup and Albany. The variety of soil types and weather conditions results in distinct characteristics in many of the classic grape varieties and Cherubino will explore these diverse flavours in this tasting of six grape varieties. Awin Barratt Siegel is hosting a Masters of Riesling and Pinot Noir Tasting on May 5 in the Gallery Room. This will be the first opportunity for the trade to taste the 2015 Rieslings and the 2014 Pinot Noirs from the top producers of Germany and Alsace, who will be pouring their wines. Producers include: Dr Loosen; Leitz; Villa Wolf; and Julien Schaal, amongst others. Speakers’ Corner, will again host a selection of informal, yet informative sessions. Vana Koutsomitis, runner up in last year’s The Apprentice (broadcast on BBC1), will talk about the pros and cons of the exposure and how it has helped build the VinobyVana brand, with innovative social media techniques to break the mould in a traditional industry. Surrey-based Hogs Back brewery has recently collaborated with Sussex-based chocolatier, Montezuma’s to create the Montezuma’s Chocolate Lager. Rupert Thompson, owner and managing director at Hogs Back and Helen Pattinson, co-founder of Montezuma’s, will discuss the venture in When Chocolate Meets Beer, and how the wine trade can learn from such innovations in the brewing sector. Joe Wadsack (wine judge, winemaker and broadcaster), will return to host a daily Challenge Joe’s Nose session, in which he will blind taste wines submitted by exhibitors. Many exhibitors will be hosting themed on-stand tastings, including specialist importer, Connoisseur Estates, which will conduct a series of pop-up tastings on their stand (Z30), demonstrating different styles and regional interpretations of classic grape varieties: Tuesday, May 3 – Chardonnay (Champagne, Oaked South African, Un-oaked from New Zealand); Wednesday, May 4 – Pinot Noir (Champagne, Sparkling Argentinian, New Zealand); Thursday May 5 – Cabernet Franc (Bordeaux, South Africa, Argentina). The tastings will be hosted by winemakers Philip Costandius from Oldenburg Vineyards, Mauricio Vegetti from Gauchezco Wines and Laurent Autreau from Champagne Autreau alongside export directors Dan Taylor from Tohu Wines and Marielle Duplantier from GRM Bordeaux. There will also be daily tastings taking place adjacent to fine wine area, The View Tastings. This includes The Fédération of the wine producers of Châteauneuf-du-Pape, who will host a generic tasting on Wednesday, May 4; their first presence at the London Wine Fair for several years. Amongst the participants are: Vignobles Mousset-Barrot; Domaine Pierre Usséglio et Fils Château La Nerthe; Domaine de la Charbonniere and Laurence Feraud’s Pegau. Sake is set to exhibit at the fair for the first time, a reflection of the growing importance of this category in the capital and beyond. The Sake Pavilion, which will be located the West Hall on stand C34, awill be curated by Sake Samurai, Natsuki Kikuya of the Museum of Sake, and will feature a selection of sake brewers and distributors: Daishichi Brewery; Sekiya Brewery; five artisan Sake producers from ENTER.Sake, the label set up by renowned techno DJ Richie Hawtin; and the UK’s well-established Sake distributors: Tazaki Foods; Ueno Gourmet; Bibendum PLB; and SAKE at UK. Natsuki Kikuya will also host a Sake Masterclass at The Fair: “Journey in the sake glass: has Japan's mystic drink ready to take off in London?” Attendees will be taken on a journey of sake regions by tasting, introducing different styles and production process unique to each brewery, and how the range can fit on to the drink menu. The Wine & Spirit Education Trust (WSET) will host a sake session in their new-format Pop-Up Classroom at the show. “How to taste sake” will be hosted by Sake Samurai, Antony Moss MW, giving a sneak-peek of the new WSET Level 1 Award in Sake, launching in August. Kensington Olympia, Olympia London, Hammersmith Road, Kensington, London W14 8UX. The London Wine Fair will be held in the Grand and West Halls this year.